Already yesterday in Rabat I felt not very good in my stomach. This morning I was'nt able to eat or to drink something, but I wanted to go further on. Therefore I was biking against the wind out of Dakhla. It was very hot and I was very thirsty, but I hardly wasn't able to drink something. After 30 km I was very sick and I vomitted an enormous amount. I was surprised how much fits in me. At the service station 10 km further on I bought the first Cola. The policemen at the control position invited me. I didn't want to be unkindly and trank one glas of tea and ate a bit bread. I would'nt tell them how I felt, otherwise they would have sent me back. After I had taken the nearly 180° bend to South, the wind changed as well so that I had still head wind. After 103 km I built up my tend and climbed down to the Atlantic sea to cool down my hot body. The wind wasn't so bad anymore. But I still was not able to drink and to eat much. During lunchtime I could ly down at a petrol station. In the evening, after 128 km, I did have another bath in the sea. In the morning I was alright again, I was able to eat and to drink properly. At last I had following wind! After 60 km there was again a service station. There I had camel in the restaurant. It took a long time for the exit-formalities. The officer at the border was very kind let me in front because the border is closing at 6 pm. There are still 3 km till the Mauritanian border station and one can't camping as there are mines. 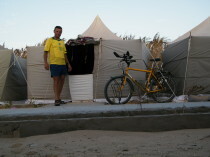 After 150 km I spent the night at the border in a tent accommodation (photo). I've had the whole day very heavy head wind. I've had an average of 13 km/h for the 117 km. After that I was totally wiped out. I stayed in a tent again. The rice with meat which I ate there was like a rock in my stomach. In the morning I felt all right and the wind was all right as well. I knew from my last trip that I would find a good place for lunchtime. Just after 1 pm I was there and they weren't surprised as I ordered chicken with chips. After 156 km I built my tend behind a sand hill and I had noral appetite again. Today I had to bike very hard: head wind! The whole day there was nothing but a few tents or shacks. In one of them I got ananas in a tin which was a nice change. In another I bought water and wanted to stay during the midday heat with coke. A small boy was facinated from the white parts of my skin which are protected by my sandels from the sun. The plump advance of a "nice girl" was too much for me so that I went on. Actuall I had to do 170 km against the wind. It took me till 8 pm to get to Nouakchott and I hoped to get the visa for Mali on Friday. In the morning my first way was to try to get the visa for Mali. I was been told in the hotel already that now are 4 days bank holidays! Therefore I can go to the consulate on Tuesday. The most of the shops are closed and there is nothing to do.